Today's unemployment figures were a timely update on the failure of the coalition's austerity policies. Unemployment has risen by 129,000 in the last 3 months to 2.62 million, while youth unemployment broke through 1 million for the first time ever. First the stats: the unemployment rate (8.3%) is the highest since 1996, the numbers unemployed the highest since 1994. Youth unemployment is the highest on record, and female unemployment the highest since 1988 (Q: what do all those years and 2011 have in common?*). The youth unemployment figure reflects a failure to create jobs - nearly a quarter of young unemployed people have been without a job for over a year. That is a grim statistic (read Danny Dorling's Injustice for the impact long periods of unemployment have on young people). With no strategy to create jobs, new cohorts of young people are going to be added to those figures in the coming months and years. Female employment is rising faster than ever predominantly because of public sector job cuts. In the last two years 250,000 public sector jobs have gone - 110,000 in the last 3 months alone. Several areas have been particularly badly hit: the civil service has lost 8,000 jobs per month in the last quarter. But even in supposedly protected areas like the NHS and education 26,000 and 16,000 jobs respectively have gone in 3 months. Now the economics: With unemployment rising, and employment falling 300,000 in the quarter that means fewer people are paying taxes and more people are claiming benefits (though nowhere near the number who are entitled to). These people are in turn spending less (because they have less) depressing the private sector and reducing VAT revenues. This is bad news for Osborne because, combined with flatlining economic growth, it means the government is receiving less revenue and paying more out in welfare than it projected. Worse still for Osborne is that inflation is at 5.4% while wage increases lag at 1.7% - meaning living standards are falling (depressing demand, reducing VAT revenue, etc). This leaves Osborne with a choice ahead of his autumn statement on 29 November: will he cut more to reduce expenditure or borrow to stimulate the economy in some way? If he cuts he'll exacerbate the problem, but if he borrows he'll be forced to abandon his 'Plan A' and admit he was wrong. So the question is whether the misery of millions is a price worth paying to temporarily shield Osborne's ego? This is a big issue for Osborn, who based his economic policy on 'crowding out' theory. In the June Budget he promised to slash the bloated public sector which was crowding out private endeavour and depressing the economy. LEAP dismantled that argument in October 2010 'Osbornomics unravels'. At that point Osborne was predicting economic growth of 2.6% in 2012, and jobs growth from the private sector. The jobs have failed to materialise (despite determined slashing of the public sector) and the Bank of England downgraded its 2012 growth forecast to 1%. Osborne appears not for turning, so it's up to us to turn him out of office, but his motley millionaires turn the UK into Greece. The article below appeared in the October 2009 edition of the LEAP Red Papers. It highlighted why it was economically inept to privatise assets, and counter to the propaganda that promotes privatisation, i.e. if the private sector is so efficient, dynamic and entrepreneurial why not give it the liabilities to turn into assets? Often, as in the case of the London Underground and most notably the banks, the private sector manages to turn assets into liabilities - a sort of reverse alchemy. In the Observer this weekend was another great expose of the myths around privatisation with news that in-house public sector bids for prisons earmarked for privatisation, had 21% added to them to make them more expensive that private sector bids. It's well worth reading: Unions blast scandal of prisons privatisation by Jamie Doward. The table below shows the level of revenue that some of these assets generate to the Exchequer every year. In addition the Student Loan Company received £900m in 2008/09 in student loan repayments (although these should be written off as unjust debts). Without even taking into consideration the revenue generated by some of the proposed asset sales (e.g. Channel Tunnel Rail Link, land sales), we can see that these raise around £1.5bn per year for the Exchequer. It therefore makes no sense to sell these assets, but to actually create more revenue generating assets for HM Treasury. The state has also recently acquired several banks and the profitable East Coast Mainline franchise – all of which, if properly run, should generate revenue to the Exchequer. Brown’s £16bn asset sale announcement on 12th October included the sale of tens of thousands of council homes – which a cynic might suggest slightly undermines his council housing credibility gained at Labour Party conference for promising to build about 2,000 council homes over the next few years. Brown’s asset sales make no economic sense – they will damage the UK exchequer in the medium to long term and result in worse services due to the innate inefficiency of the private sector. Private sector – more efficient? This asset sale further exposes to ridicule the rhetoric of private sector efficiency and dynamism. Why not sell state ‘burdens’ to these entrepreneurial alchemists to turn to profit – using their innate efficiency? Because it’s all a myth as this recession has already demonstrated. In the days following the public sector takeover of the East Coast mainline rail franchise, it was announced that . . .
Here’s a basic economics lesson: which will provide a better public service – a public sector operator where any surplus is reinvested into service improvements, lowering costs, and raising staff wages; or a private sector operator that must divert a proportion of that surplus to its shareholders? The best alternative to privatisation is a positive alternative. You can download LEAP's 2008 publication Building the new common sense: Social ownership for the 21st century (you can buy a hard copy here). Anti-capitalist protests are essentially demands for social justice, democracy and greater public accountability of corporations and their rich controllers. The issues are not hard to see. Major corporations dodge taxes through dubious schemes which create nothing of social value, but yield huge profit-related financial rewards for executives. Fearful of upsetting corporations and wealthy elites, successive governments have shifted taxes to less mobile capital, labour, consumption and savings, and attacked pensions, education, healthcare and other hard-won social rights. No policy to restrain executive remuneration has been developed. So the protests need to be turned into a programme of reforms to enhance the accountability of corporations and their wealthy controllers. First, the impulse of wealthy elites and large corporations to opt out of the tax-paying obligation needs to be checked by public scrutiny. As part of this, the tax returns of individuals with above-average annual income should be made publicly available. The tax returns of all UK registered corporations, together with details of tax avoidance schemes, should also be public. Tax is the price that we pay for democracy, social rights and a civilised society. Our contribution towards that should be a matter of public record. The public availability of tax returns would enable citizens to alert, analyse and inform regulators of dubious practices and demand action. There are already moves towards greater transparency and public accountability in other countries. Every year, around October/November, the Norwegian tax authority publishes the skattelister or "tax list" for almost all citizens. Finland also publishes the taxable income of citizens who earn more than €10,000. Through public disclosures, Norwegians and Finns are able to learn how much tax is paid by everyone from actor/director Liv Ullmann to the CEOs of Nokia. Armed with the same standard of transparency, UK citizens could also ask searching questions about the taxes paid by MPs, political party funders, hedge-fund and private-equity entrepreneurs, speculators, wheelers and dealers of Private Finance Initiative schemes; banking fat cats, architects of tax-dodging schemes, and opinion formers. Globalisation, meanwhile, has turned corporations into footloose multinational entities, but their accountability has hardly changed. Company accounts primarily publish one global figure for how much corporation tax a company pays even though it may be trading all over the world. How much corporation tax specifically is paid in the UK is not easy to ascertain. This should be modernised by what is called country-by-country reporting. Corporations would be required to publish a table showing their sales, profits, costs, employees and tax paid in each geographical jurisdiction of their operations. This would immediately highlight anomalies of companies having a large volume of sales in one country but with revenues and profits booked at another place with relatively few employees. Consider Google, which uses perfectly legal techniques to channel sales through offshore havens to shave its tax bills. The 2010 accounts for Google Ireland Limited show that an operation with around 1,500 staff generated a turnover of €10.9bn. Either the company has the most productive staff in the world, or there is more to it. The company reported pre-tax profits of only €18.5m and paid €5.6m in corporation tax. A key to reduction of taxable profits is the royalties paid to offshore subsidiaries, which count as deductible expense in one place, but tax-free income elsewhere. Democracy can also be used to curb fat cat remuneration. Many front-line staff at banks earn under £17,000 a year. Banks pay measly interest on savings and have a history of abuses relating to mis-selling of pensions, endowment mortgages, loans, payment protection insurance and much more. Most of the banking risks, as evidenced by the banking crash, are borne by taxpayers rather than shareholders. So employees, savers, borrowers and shareholders should act as a proxy for taxpayers. If they think that Barclays chief executive Bob Diamond deserves £30m, then that is fine. But I think it would take some persuasion to convince poorly paid employees or victims of mis-selling to sanction mega-bonuses for executives. With better information about organised tax avoidance, citizens can decide whether to support or boycott corporations. If the tax authorities reach secret agreements with say, Vodafone or Goldman Sachs, then that will be visible, too. And executives wanting mega-bonuses will need to ensure that employees and customers are also rewarded. Democracy and public accountability are the best antidotes for abuses. Bailed-out bank Royal Bank of Scotland is back in the black and lending again - but still continues to sack their own workers. The 83 per cent state-owned bank posted third-quarter pre-tax profits of £2 billion today, following a £678 million loss earlier this year and a £1.6bn loss in 2010. The bank reported £8.1bn in lending to small and medium-sized enterprises (SMEs) - just shy of the £8.2bn target set out under the government's controversial Project Merlin deal last year. The news came within a week of government figures which showed that Britain's banks are turning down more than one in three applications for small business loans - ignoring a key part of the deal. The Office for National Statistics reported just 65 per cent of small business loans were approved in 2010, compared with 90 per cent in 2007. But it revealed that RBS was still the biggest fish in the small business pond, providing 40 per cent of SME loans in Britain compared with 35 per cent in 2010. The report brought RBS small business lending to £23.6bn so far this year - around 5 per cent short of the Project Merlin target. But economists savaged the bank today for persisting with mass lay-offs despite its multibillion bounce-back. The bank announced plans to axe more than 20,000 jobs in the wake of the 2008 bailout. And RBS chief executive Stephen Hester said yesterday the cuts would continue "to reduce the impact on customers and shareholders of the regulatory and market developments." Left Economics Advisory Panel co-ordinator Andrew Fisher blasted the banker's comments, saying that they showed the bailout had failed to change City culture. "It is sacking workers to generate dividends for shareholders on the back of taxpayer pounds, while continuing to make risky and bad investments through its Global Banking and Markets arm. "This is further evidence that the bailout was the privatisation of public money, not the public ownership of private banks. "What we need is the full public ownership and control of UK banking to end the culture that has led our economy to the precipice and to direct investment where it is socially useful," he said. Seumas Milne is right that governments should start bailing out the real economy, rather than the banks, with public investment for growth (The elite still can't face up to it: Europe's model has failed, 3 November). But from where will the funds come for this? A Tobin tax will not generate sufficient, even if it could be made to work internationally, but there is alternative. A central cause of current economic instability has been the astonishing accumulation of private wealth to the richest 10%, and the use of this in deregulated global markets for speculative trading and purchase of assets including property, currencies and commodities (Markets slump after Greek referendum call, 1 November). So the $43bn funding gap of Greece's government is matched by about the same amount going offshore, much of it reported as being put into the London property market by wealthy Greeks. This continues to rise while others slump. On a larger scale we might look at the New York Mellon Bank, which holds the assets of high worth people, and whose website notes that it is "focused to help clients manage and move their financial assets". These, in this one bank are listed as $25.9trn, which is of course enough to pay off the US national debt, solve the euro debt crisis and have change. The world is awash with cash, while the productive capacity of its peoples and industry is the greatest in human history. But instead of taking some of these assets and using them to promote investment in a sustainable economy, the preferred government solutions are to print money and impose cuts which affect the poorest and create unemployment. The first of these generates inflation, damaging pensions and savings while adding to the financial stress caused by the second. The obvious solution is a wealth tax on the richest 10%, which we first advocated a year ago. Now the head of the biggest bank in Italy, Corrado Passera, is also promoting the idea, saying that Italy's $2,750bn debt could be resolved by a tax on Italy's private wealth. This is five times the size of its debt. It also shows how misled we are by media and political commentary on "countries going bankrupt", when what is actually being described is a cash flow problem. Other solutions such as effective income tax will be needed in the long run but what is crucial now is a fundamental restructuring of social wealth to repair the huge damage caused by the release of the free market, and the political courage to plan an economy of the future. EU dominos - who's next? 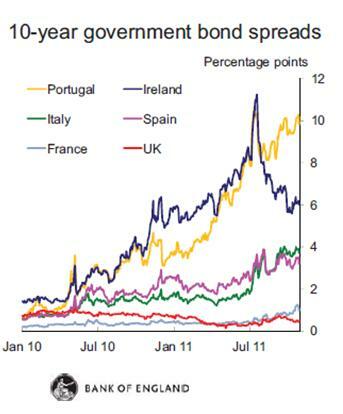 The chart below (from the Bank of England's Charles Bean) shows the 10-year government bond spreads for selected EU nations: Portugal, Ireland, Italy and Spain, as well as France and the UK. Where is Greece in this 'who's next for disaster' chart? You might ask. Well, Greece is off the chart with its 10 year bond spreads currently attracting interest at somewhere north of 26%, according to Bloomberg. The second domino effect is on the bond markets, which would be spooked by a default and hike interest rates on riskier debtors - in the same way that high street banks have jacked up margins and became more cautious lenderdfollowing the credit crunch, restricting lending to businesses and damaging the economy. This could mean Portugal, Spain, Ireland and Italy paying more for their debt - exacerbating their debt crisis, and potentially sending them into a Greek-style death spiral. It's worth bearing in mind that if Italy, as the third largest eurozone economy, got in trouble the whole eurozone would be at risk. It currently has 2 trillion euros of debt. 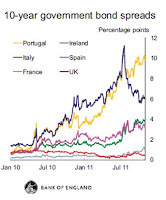 Since the Bank of England produced the above chart, Italy's bond interest rates have risen from around 4% to 6%. If that gets up to Portuguese levels, let alone Greek, then Italy is in serious risk of default. Even a 20 or 30% haircut would be deeply traumatic - crashing banks around the world, with serious domino effects. That's why the G20 meeting in Cannes is obsessed with this issue: finance capitalism is at risk! To know where we should go on bank reform, we have to understand where we have been. The banking crisis that swept the globe in 2008 was not a crisis of the banks alone, but a crisis of government: the failure of successive governments in the UK and globally to have any oversight of the banks. It was negligent. Many of us as parents know what would happen if we were negligent: if you let a toddler dictate what they wanted to eat, the diet of jelly, ice cream and cakes would probably leave them obese or in a diabetic coma, while the sugar-induced highs and crashes would bring trauma to the household. Never mind the nanny state, the government has been a bad parent to the toddling banks. It has allowed them unsupervised access to the biscuit barrel. The banks are now even more like toddlers, unable to stand without government support. We should be clear: the banks are indeed too important to fail. Millions of working people depend on banking for their savings, their pensions, their mortgages and for the daily management of their finances. The assets traded and gambled around the globe are people’s life savings, their security in retirement and their family homes. The current situation is even more precarious than in 2008. Several banks and governments teeter on the brink of collapse. A Greek default could result in a domino effect. While the UK was in a financially secure enough position to offer bail-outs in 2008, it is doubtful if today that would be politically acceptable or economically affordable. Any rational observer would concede that anything vital to our society demands close oversight. The shocking thing about the banking collapse in 2008 was how the regulators were unaware of, and did not understand, many of the intricate schemes and processes operated in the banking system. It is time the public interest became a factor in our banking system. Given the importance of banking – not as an end in itself but because of what it facilitates – and because of its vulnerability, it is essential that the rebuilding of the system is done in the public interest. My trades union has a clear policy: the banks should be publicly owned. Some might say this is ideological. I would say it is logical. Banks are so vital that they have to be underwritten by the public – just like public transport and utilities such as gas, electricity and water. If British Gas or Thames Water went bust, the government could no more shrug its shoulders and say “that’s the market” than it could when the UK banking system teetered on the brink in 2008-09. But there are several other reasons why the banks should be publicly owned. First, a bank underpinned by the state could lend at lower rates and offer savers higher rates. When Northern Rock was nationalised, Sir Richard Lambert, then CBI director general, told the Treasury Committee: “It is critically important that state ownership of the bank should not be allowed to distort the savings market, through access to government funds on favourable terms”. In other words, offering the public (and businesses) a better deal would “distort the market”. Just as private finance initiatives have proved incredibly wasteful, the inherent stability of the state makes it the natural home for secure banking. Second, we are suffering from a crisis of investment. Banks are cautious about lending yet there is no end of investment opportunities from much-needed housing to redressing the UK’s woeful underinvestment in renewable energy infrastructure. Investment is essential to creating jobs, cutting the welfare bill and increasing our tax revenues – closing the deficit. At the moment we have the worst of all worlds: a government irresponsibly cutting capital spending and private banks that are unwilling to lend. Too much of the money banks have gained through quantitative easing has been speculated with or invested overseas. Third, we should act in the public interest. While my union members are demonised in the rightwing tabloids as feather-bedded pen pushers with gold-plated pensions (the average member is on £22,850 and will get an £80 per week pension), the fat cats are rewarded with obscene bonuses and huge salaries. We could direct investment to where it is socially useful, ensure savings are encouraged and get a better grip on the housing market and mortgage finance. The question is one of democracy: it is the wages, pensions and mortgages of millions that create the wealth banks have squandered. It is time those millions controlled their billions. Events in Greece over the last 24 hours have resembled the plot from a political thriller – A Very British Coup perhaps. Under fire Greek Prime Minister Papendreou announced a referendum on whether to accept the bailout terms agreed at the recent EU summit. He apparently did so without consulting his Cabinet, and by lunchtime his finance minister was in hospital with a suspected heart attack, and a backbench MP resigned. He also took the surprising step of replacing all of the military top brass – the heads of the defence staff, army, navy, and air force – all replaced and apparently without any warning to Cabinet or military. Obviously the Greek military has history – a CIA-backed junta ruled Greece from 1967-74 – but did Papendreou believe a coup was on the cards? Certainly there are the siren calls for a government of national unity from opposition MPs (and the PASOK MP who resigned yesterday). The major opposition party is right wing, and the security establishment will have been rocked by the massive and occasionally violent protests and strikes in Greece which have intensified and grown in recent weeks. Plus by calling for a referendum, he will have infuriated the EU and IMF – and therefore NATO (of which Greece is a member) – and so the Greek military and political right (supportive of the bailout terms) would have potentially had international support. Twenty four hours after issuing the referendum call, the Cabinet has unanimously backed it, and it will take place in December according to rumours. With no further resignations, Papendreou seems likely to survive a confidence vote on Friday too. While all this clandestine backroom activity may have been necessary to get the referendum (and avert a coup?) it was the very public protests that have won it. The marches, rallies, strikes, direct action and street-fighting against the government, banks and police have been a demonstration of the commitment of the Greek people to resist austerity. Now the people have the final say in a referendum, which as Papendreou has said will effectively be on membership of the euro. So what would a yes or no vote mean? A yes vote would mean misery heaped upon misery for the Greek people. With a stagnant and contracting economy, high and rising unemployment (16% nationally, but 40% for young people – double the respective UK rates), jobs and services already slashed, taxes increased and wages cut or frozen. The bailout demands an intensification of austerity to satisfy creditor nations and banks. A no vote is more complex. It would mean defaulting on debts, an exit from the euro (so as not to further weaken the currency). It would mean reinstating a national currency (drachma mk2). As Greece would still be an economic mess, this is no silver bullet. The Greek economy is heavily flawed and needs urgent investment. Tax evasion is rife and needs to be immediately addressed, but so does investment – in order to create jobs and bring unemployment down. Greece would need a friendly nation to support it – to lend to it on a comparatively favourable long-term basis. Which nation could do this? That would depend on the nature of the government in place at the time. A possibility would be one of the BRICs least affected by Greek default, or by going to the Latin America via Mercosur or even ALBA for an extraordinary loan. To avoid the money markets playing havoc with the new currency, and a descent into Weimar hyperinflation, there would have to be firm capital and export controls – which would in turn necessitate breach EU rules, and presumably necessitate exit from the union entirely. Bilateral arrangements, such as those achieved by other non-EU states should be possible but will take time. Much of the above is necessarily speculative – we are entering unchartered waters – but one thing is clear the people of Greece have forced this referendum through considerable struggle. They now need to realise their power and create a vision that can unite what they are for too. Their victory (albeit partial)* should also inspire anti-austerity struggles across Europe, particularly in Spain, Italy and Portugal. *It is a victory to have forced their right to have a say, when the EU and IMF though they had done a deal to salvage banks and creditor nations at the Greek people’s expense. But the victory is partial because – without winning a no vote in the referendum and then, crucially, having a unifying vision that their movement can force into the political arena – it may only be kicking the can down the road. But for now, it is the Greek people doing the kicking.